New York Fashion Week is over, but before you get too sad just remember there is still the rest of Fashion Month waiting for us: London, Paris, Milan. But first lets talk about a few more of our favorite NYFW Fall 2012 ready-to-wear collections. No Fashion Week coverage would be complete without talking about Mr. Marc Jacobs. As usual Jacobs not only gave the crowd fashion, but he also gave them a show—fantasy: artist Rachel Feinstein created paper ruins, the music was Oliver Twist, and Cat-in-the Hat-esque, oversized fur hats. The stoles fastened with large, okay gigantic, safety pins was among my favorite stylings… anyone know where I can get a giant-size pin? Also loving the paisley, talk about a youthful and chic spin on a pattern usually reserved for wallpaper… Only Marc. Now to a collection that is more visually wearable, our favorite celeb stylists and reality TV star—Rachel Zoe. Gorgeous models, who appeared to get prettier and prettier with each look, worked the pristine-white runway with long flowy locks,California-girl braids and heavily lined eyes. Though most of the collection showed Zoe’s favor for the ‘70s, there were the multi colored, knit, sweater dresses with matching cardigans—absolutely adorable. Sequins and faux fur, again all Zoe, were a clear favorite for the stylist-turned-designer. Faux fur coats were spotted over everything from pantsuits to dresses. Zac posen is no doubt a celeb, red carpet favorite, and there is also no doubt that his Fall 2012 collection will woo the Hollywood crowd again (though I can’t lie that for me, Pre Fall 2012 is my favorite). 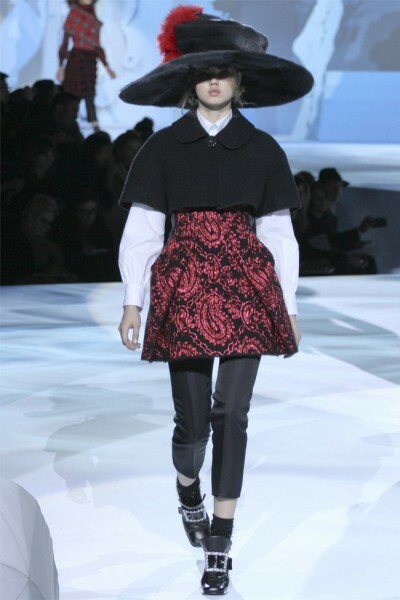 Posen opened with super model and fashion fan favorite Coco Rocha in a black and red, Japanese inspired, floral print skirt suit a mere foreshadow to what would be a Coco finale—an extravagant, utterly ball gown, blue dress suitable for a princess. In between these looks were a lot of muted greys, greens, and blue and a few oversized Kimono inspired belts. While we are on the topic of Zac I am in love with this coral/tangerine dress from Z Spoke by Zac Posen. The square neckline, body conscience fit, and flared skirt are perfection.